Anne Hathaway’s face tells it all when it comes to our reaction to finding new ways of incorporating scarves into our wardrobe. Scarves are no longer confined to cold winter days, but rather have a place in each of the four seasons when worn correctly, as proven by Hathaway. Hathaway seems to have mastered the art of integrating scarves into her daily looks in an effortless and chic fashion, another reason why we can’t help but want to emulate her style. Thankfully, DesignerShare is stocked with plenty of scarves to help us echo her looks. We’ve all had those days where our bed head rivaled with our lack of time to get ready in the morning. A quick and easy fix to the problem? A head scarf. As seen on Hathaway, above, not only does wearing a scarf in this style solve the problem of a bad hair day, it instantly takes your outfit up a notch in a stylish and sophisticated manner. One of our absolute favorites for rent right now on DesignerShare is this Hermès scarf. We find that the gold color compliments a range of hair shades as well as pairs well with a variety of hues in outfits. We also love the idea of incorporating a headscarf into your boating day style for a nautical feel. Another way to rock a scarf year round is by tying it around your neck in the same manner as Hathaway, above. This addition to an outfit will take any look from boring to head turning. Scarves tied in this style can be paired with a casual weekend look like Hathaway’s, or even with a power suit for your work look to add an unusual flair to a rather routine ensemble. 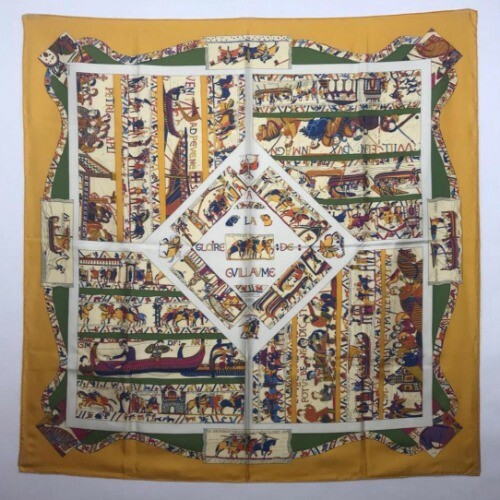 This Dior silk scarf for rent on DesignerShare is the perfect one to try this look out with this summer. It’s fun, nautical print will add a punch of color to any outfit. We also love tying our scarves more loosely around the neck, such as Hathaway did here, for a different take on this look. This Hermès Pink Balade En Berline scarf for rent on DesignerShare is great for getting the job done. Its intricate print adds some interest to any outfit that needs some spicing up. Scarves can be incorporated into your daily look without being worn directly on you as well. We love tying scarves onto our favorite staple purses to change up their look from season to season. This Tory Burch lobster print scarf for rent on DesignerShare has been getting us through the summer for this very purpose. Don’t be afraid of trying scarves out in unconventional ways. From being worn as a belt, to throwing one on as a shawl, scarves have endless ways of being worn, making them a sure staple in our closets here at DesignerShare.